India and Pakistan are home to some of the world’s best pickles, all types of fruit and vegetables preserved in a fiery mix of spices, citrus juices and oils. The best are little more than sliced chillis with lime, oil, mustard and turmeric. They’ll blow you away. Literally. 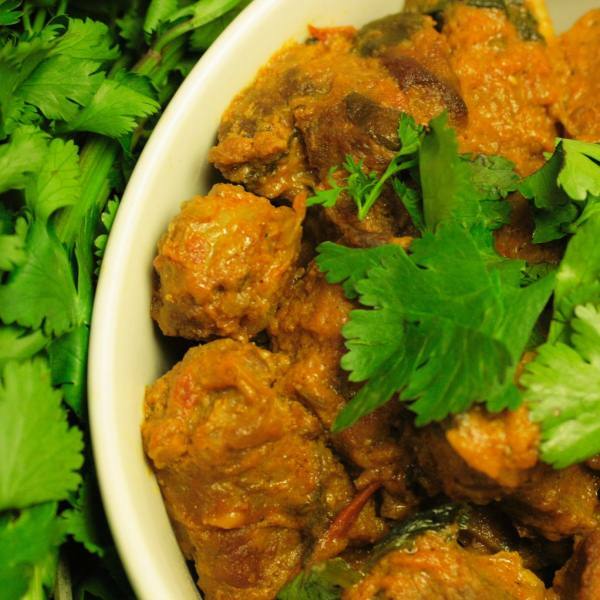 In Hindi, ‘achar‘ means pickle, and gosht achar is a cousin of the pickle-making process, a lamb curry that uses many of the spices typical to pickling. This recipe came to me in an unusual way. We had a takeaway the other night, and tiring of the usual place round the corner, ordered from the Aagrah group’s mothership restaurant in Shipley. The Aagrah is a superb restaurant, a small chain with branches across Yorkshire and a first class and well-deserved reputation to match. The difference in quality between our usual takeaway, itself no slouch, and the Aagrah’s was immense. The paper bag the food came in bore the Aagrah’s recipe for Gosht Achar on the side. I knew straight away what was going to happen. I was going to cook this, and it was going to be bloody marvellous. This recipe looks long, but it isn’t complicated. It’s just a matter of being organised, having everything ready and putting things together in the right order. Curries are quite easy, but don’t tell anybody. Start by browning a kilo of cubed lamb in small batches, in hot oil in a large pan. There will be a lot of smoke and spitting. Lamb on the bone will have more flavour. When the lamb is done, nudge the heat down a little and add a medium chopped onion to the pan, frying until it turns a golden brown colour. Scrape the bottom of the pan with a wooden spoon as you go, to lift any burnt on lamb into the onions. Add a dessert spoon each of finely chopped or minced garlic and ginger, fry for a couple of minutes before adding three or four cardamom pods, half a dessert spoon each of fennel, fenugreek, onion and mustard seeds, and six bay leaves. Stir for a few minutes until the seeds are nicely toasted, then add a generous half a teaspoon of turmeric powder, a dessert spoon of ground coriander, half a dessert spoon of ground cumin seeds, a teaspoon of salt, a couple of sliced green chillis and red chilli powder to taste. Start with half a teaspoon, but remember that there are green chillis in there too. Fry for a couple of minutes. Add a can of chopped tomatoes, two or three tablespoons of plain yoghurt and a scant dessert spoon of white wine vinegar. You’ve now got a masala. It should bubble away for a minute or two, filling the kitchen with exotic smells. Return the browned lamb and it’s juices to the pan and turn the heat down to a gentle bubble. The lamb will take about an hour and a half to cook through and tenderise. Remove the lid for the last half an hour to let the liquid steam away and the sauce thicken. Just before serving, add a good handful of chopped coriander and stir in half a dessert spoon of garam masala. The garam masala is important – it gives the curry a fresh and spicy taste. Serve with plain boiled rice or a naan bread. Great recipe, cooked it a few times! Works quite well with chicken also.